Class! Settle down, please, and listen to your teacher! She's Madison High School favorite Connie Brooks! 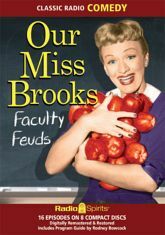 Miss Brooks bravely battles against the absent-mindedness of Mrs. Davis, the disdain of Principle Conklin, the interference of Daisy Enright, and the reserve of Mr. Boynton. Her struggles are uphill�and uproarious! Here's Eve Arden, with Gale Gordon, Richard Crenna, Gloria McMillan, Jane Morgan, Jeff Chandler and Robert Rockwell in sixteen adventures in mid-century education!